We had the honour of having representatives from Autism Advocates Brunei at our Annual Conference on the 8th of October. Brunei Times wrote a feature on 19th October 2016 about their visit here and their takeaway from our conference. THREE Bruneians recently attended the Early Autism Project (EAP) Malaysia Annual Conference in Kuala Lumpur. Ak Mohd Izwan Shafuan Pg Md Daud and Rasyidah Samah are alumni of the Young Southeast Asian Leaders Initiative (YSEALI) Fellows Programme in the United States (US) while Audrey Choo runs the “AC-ACE Creative Tuition School” which offers one-on-one sessions for special needs students. Rasyidah is also the founder of ‘Autism Advocates Brunei’, which currently runs as an online platform on Facebook to bridge the autistic community, parents and teachers in Brunei. 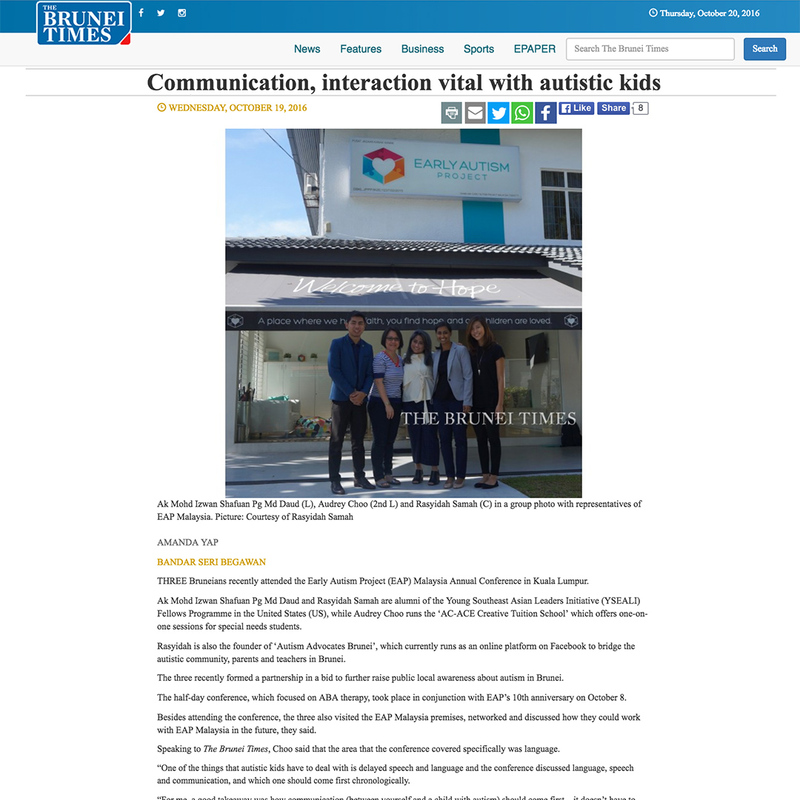 The three recently formed a partnership in a big to further raise public local awareness about autism in Brunei. The half-day conference, which focused on ABA therapy, took place in conjunction with EAP’s 10th anniversary on October 8. Besides attending the conference, the three also visited the EAP Malaysia premises, networked and discussed how they could work with EAP Malaysia in the future, they said. Speaking to The Brunei Times, Choo said that the area that the conference covered specifically was language. “One of the things that autistic kids have to deal with is delayed speech and language and the conference discussed language, speech and communication, and which one should come first chronologically. “For me, a good takeaway was how communication (between yourself and a child with autism) should come first – it doesn’t have to be verbal, it can be gestures – followed by language. “Once you have language, then you can talk about speech,” she said. Meanwhile, Rasyidah said that visiting EAP Malaysia and talking to their representatives had really inspired her. “At the moment, in Brunei, there is still a lack of supporting bodies (for autism). Something that really interested me about EAP was they started off doing freelance then they developed their staff and now they have a lot of non-profit funding as well,” she said. The three said they are currently collaborating to launch an autism awareness project in December. “One of our main aims is to (emphasise) on early intervention because most parents (of children with autism) that I’ve come across can be quite in denial. “There are early signs and symptoms (of autism in children) and it’s something that we shouldn’t ignore,” Rasyidah said. Choo said that parents of autistic children would have to be willing to accept that their children have developmental delay and capitalise on early intervention, if they wanted to help their children. “If you want to help your child, that’s the right way and if you’re in denial, you’re not helping your child and down the road, there’ll be more issues to be dealt with,” she pointed out. EAP Malaysia provides individualised intervention treatment programmes for people with autism in association with its parent company Wisconsin Early Autism Project (WEAP) in the US.